So, ‘how is Project Week so far,’ was the innocent question. Swordplay may not be most people’s first memory of Project Week – the annual springtime week in which Pearson College UWC students are asked to create and experience mentally and/or physically challenging self-directed adventures – but it’s not exactly out there either. This year’s Project Week initiatives ranged from attending the Forum for Young Canadians in Ottawa to comprehensive planning for Pearson’s Women’s Empowerment year to expedition kayaking or sailing to exploring intersectionality and social justice. All students are required to follow up the week with written reflections and deliver a public presentation about their experiences and conclusions that is open to all on the campus community. A week of fencing instruction at a donated downtown studio space in Victoria’s historic Fan Tan Alley is a first, though. The idea was the brainchild of Donovan Faraoni (YR 45/2020, Canada-QC) who is an enthusiast of the “combat sport” that is sometimes called the first European martial art. “(Donovan’s call) was a little out of the blue,” said volunteer instructor Caleb McIntosh. “But fencing is one of those things that I think a lot of people want to try – in the last couple of years we’ve been working on getting fencing in more schools, for example. “A big part of our mission is to spread the word about the sport and to give people a chance to try it out and this seemed like a really good opportunity,” added Caleb, who is head instructor for the university’s fencing club and is part of the Victoria Fencing Club. Caleb focused not only on the form and physicality needed to fence but also on the protocol and respect that are integral parts of the sport. He led training for all four Pearson students participating in this project week initiative. “That is a big challenge – de-intimidating and just getting people comfortable with the sport” said Caleb. “For example, on the first day we worked just to get people used to being hit with swords – there is a natural reflex to avoid that. Everybody can be a little bit shy, I find, the first time when they are trying something new. I feel like once you get into it and have the chance to fence a bit more, it’s pretty great! In addition to Donovan and Zhibek, students Deandre Gutierrez (YR 45/2020, USA) and Danik Savoie (YR 45/2020, Canada-NB) also trained during the week. Both were enthusiastic beginners who acknowledged that part of the attraction was the chance to explore a sport they might not otherwise have the chance to learn. “I would say it’s a mental and a physical challenge,” said Deandre. 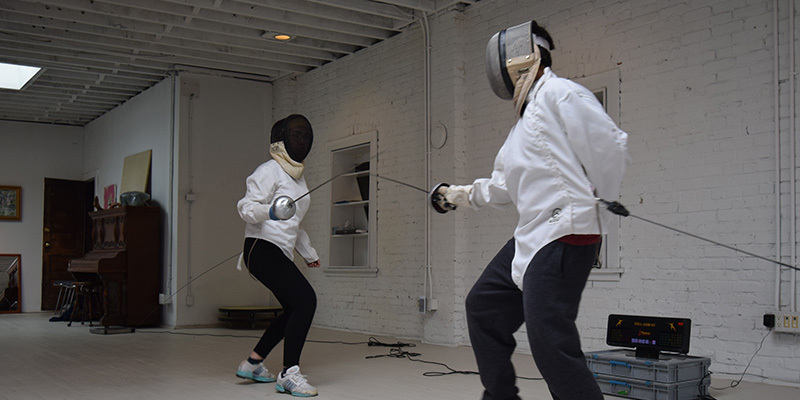 “Physically, we are pretty active anyway at Pearson…but fencing is very challenging and very strategic — and a lot of fun. Danik, who is quite tall, was asked if his height gives him an advantage over opponents. “In fact, yes, and no. For epee having more distance with your arm can be more advantageous because during epee if both fencers hit, both get a point so if you can hit first you get an advantage but talent, skill and ‘mind game’ are the things that give you an advantage.